400 RPM more than the DA 60 on the same prop. Custom built DA carburettor cover with optimized air pressure measuring right beside the intake. Cylinder piston and crankshaft developed by Desert Aircraft. CNC milled, 7075 T-6 alloy crankcase. Long conrod with gudgeon pin located very near to piston crown to reduce side thrust. Walbro Choke-Carburetor with Desert Aircraft four petal reed valve. Battery ignition with automatic advance and retard. DA engines are designed using the latest tools and techniques, including 3D CAD and Stereo Lithography. Rapid spares delivery and repair service from Germany by Toni Clark practical scale GmbH. 3 Years Guarantee* by Toni Clark practical scale GmbH. Compared to other flat twin engines in its class, the DA 70 has an excellent power to weight ratio. 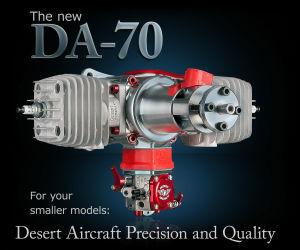 The DA-70 out turns the DA 60 by about 400 RPM on the same prop, with a weight of only 1850 g including the ignition! The specially made carburetor cover not only looks very neat; it measures the intake pressure directly next to the carburetor intake. As a result of this, air pressure fluctuations inside the cowling do not affect the carburetor so much as with conventional Walbro covers. A prominent feature with DA-engines is the very long front crankcase. The third bearing is placed well forward, directly behind the propeller hub. The very stiff and long crankshaft housing makes for ease of installing the engine under the cowl. The throttle response is as like on all DA engines very spontaneously, due to the small volume of the crankcase. 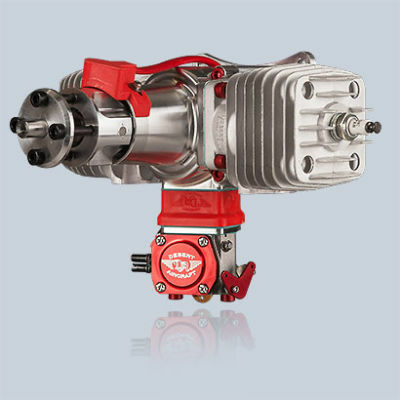 The reed valves developed by DA, plus the Walbro carburetor, are perfectly adapted to the engine, giving an even-running engine in all attitudes and throttle settings. An aluminum throttle arm is fitted to the carburetor throttle shaft. The DA-70 has been designed especially to run with two silencers and only develops its enormous power with these. As with all DA engines, the DA-70 has been factory test run and the carburetor needles adjusted. The world wide DA service and support is unique. If you want to enjoy the smooth running characteristics of a flat twin engine, then the DA-70 is the ideal power plant for your model in the 60-80 class. Super Silence Carbon 24x12", 26x8"
Super Silence 21x12", 22x10", 22x12"
We recommend the use of Aral Ultimate 102 and a good synthetic two stroke oil like BEL-RAY H1R.